I love Reese’s Peanut Butter cups. Totally. But, since I can’t have peanut butter, or the milk chocolate, or the refined sugar, I needed an alternative to enjoy. 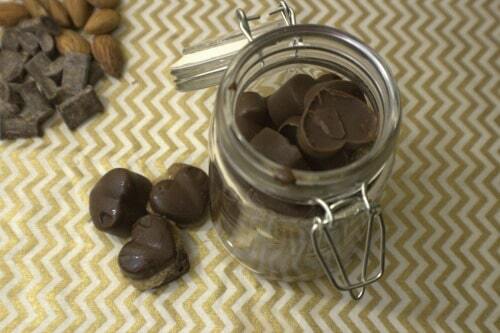 These chocolate almond butter cups are the perfect replacement! At first, my husband wasn’t sure about them. After all, how could I replace our FAVORITE candy treat with a homemade version and make it taste just as good? I took the challenge and wound up with something we love. I think you will like them, too. Easy to make, and full of good for you ingredients, these chocolate almond butter cups are the perfect treat for a weekday afternoon, or to take to a party to share! They are paleo, gluten free and dairy free so that they can be enjoyed by just about everyone! Begin by mixing together the melted coconut oil, 1/2 cup honey and cocoa powder together. Place in the freezer for about 20 minutes to harden completely. Take the almond butter and mix well with the other 1/2 cup of honey. Spread almond butter and honey mixture on the first chocolate layer. Freeze again for 30 minutes to harden. Add the remaining chocolate mixture on top freeze to harden. Pop out of molds and store in the fridge. ENJOY! What is your favorite candy treat? Are you able to make it at home with real food ingredients? Easy to make, and full of good for you ingredients, these almond butter cups are the perfect treat for a weekday afternoon, or to take to a party to share! They are paleo, gluten free and dairy free so that they can be enjoyed by just about everyone! Begin by mixing together the melted coconut oil and cocoa powder together. Take the almond butter and mix well with the honey. Cashew butter would be awesome, too! !